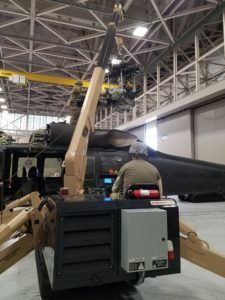 JOINT BASE LANGLEY-EUSTIS, Va. — The ability of Army helicopter repairers to support maintenance in remote locations may improve enormously if the airmobile Expeditionary Crane proves effective in austere environments during operational testing. Aircraft maintainers of Alaska’s 1st Battalion, 52nd Aviation Regiment, 16th Combat Aviation Brigade, ran five Self-Propelled Crane Maintenance and Positioning, Increment II (SCAMP II) systems through the paces in downed aircraft and harsh environment scenarios. 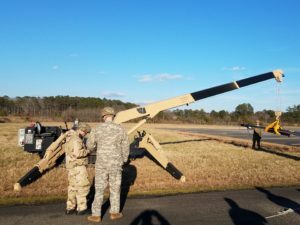 “The Expeditionary Crane capitalizes on a commercially available crane that already has a proven track record in the public sector as well as Army Aviation for performance and reliability,” said Lofthouse. According to 1-52 Avn. Regt.’s Staff Sgt. Ian Van Harper, the SCAMP II reduces repair times. The Expeditionary Crane has the potential to increase a unit’s ability to conduct split-based operations, because it is lighter and airmobile. 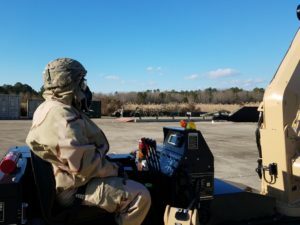 “If a unit was fielded with multiple systems it would greatly increase the capability during split operations to multiple locations,” said Staff Sgt. Bradley Obenland, 1-52 Avn. Regt. 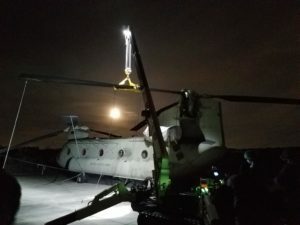 “The team was able to see and hear how the Soldiers interacted with the equipment while driving the SCAMP II across varied terrains and perform major maintenance procedures on the CH-47 and the UH-60,” said Mr. Gary Vaughn, assistant test officer, with the OTC’s Aviation Test Directorate (AVTD). 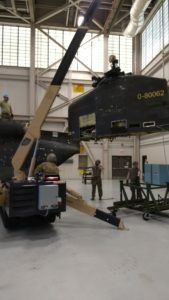 “Upon arrival to a simulated downed CH-47, maintenance crews removed and reinstalled an aft aircraft blade,” said Sgt. 1st Class Leonel Rubio, operations NCO, with AVTD. “These conditions enabled evaluators to determine the Expeditionary Cranes’ overall effectiveness in enhancing the maintenance crews’ ability to complete DART operations in austere environments,” he added. 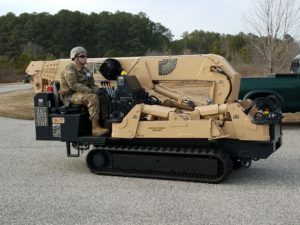 Data collected during the test will support an independent evaluation by the U.S. Army Evaluation Center (AEC) at Aberdeen Proving Ground, Md. AEC will determine the SCAMP’s effectiveness, suitability, and survivability as an expeditionary crane. AEC’s evaluation will support a full-rate initial production decision later this year. Operational testing began Oct. 1, 1969, and as the Army’s only independent operational tester, OTC is celebrating “50 Years of Operational Testing.” The unit tests Army, joint, and multi-service warfighting systems in realistic operational environments, using typical Soldiers to determine whether the systems are effective, suitable, and survivable. OTC is required by public law to test major systems before they are fielded to its ultimate customer — the American Soldier.